at the beginning of the week, i thought i had stalled at my new year’s resolution to meet all 325 facebook friends i had. i’ve since made other, newer friends. and i’ve had all sorts of adventures utterly unrelated to facebook. but wednesday, i got back on the road–driving out to ohio to visit eastman (f2fb friend #1) and to try for the fifth time to see a facebook friend i have never met in cleveland. i failed at the latter, but succeeded at the former. then i struck northwest towards royal oak, where i met f2fb friend #230 john s. schultz. it was particularly good to see him because i felt like i was recovering my resolution, recovering my self-respect, recovering my confidence. i have never met john but he was quite hospitable and directed me to his office in central royal oak. john is a natural storyteller. over a meal of thai food, he told me about growing up as a navy brat and his early years at a detroit paper. in royal oak, he had a “stop the presses” moment when father charles coughlin died. john advised the presses be stopped but was overruled by a senior editor. the next day, the detroit papers scooped the story! father coughlin was the rush limbaugh of the thirties, and he had a radio show out of royal oak that was so popular a separate post office to handle fan mail had to be built. he died in 1979 after withdrawing from public life. john once worked at a paper where the exterior window looked directly into the apartment of jack “dr. death” kevorkian, who was known for helping people commit suicide. john and jack had a “hey, nice day today” passing acquaintance and then one day john came to work and the place was mobbed with reporters trying to get an interview with jack. talking about the right to die and religion led us to a deeper conversation about our own families and lives. i felt like i was talking with an old friend. he and his wife have three daughters, the first of which died of a brain tumor at the age of three months. i was really touched that he was able to show me pictures of all three girls–he keeps them in his wallet, one photo of an infant, the other two of twentysomethings with winning smiles. i cannot imagine the courage to have a child, to try again, after such a painful loss. i admire john. he also told me not to sweat the small stuff, such as when eastman started off my f2fb new year’s with smoking cigarettes on the front porch together. there are worse things. . . and john should know, as he quit smoking more than half a century ago. . .
john and i know each other through arcadia publishing. i’ve done arcadia regional histories of northfield and winnetka,illinois as well as kearney, missouri. 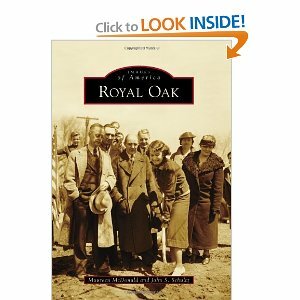 john, along with maureen mcdonald, wrote a history of royal oak. . .
the combined populations of kearney, northfield and winnetka is under 20,000. royal oak boasts 60,000 residents. you do the math on our respective sales! i’m very glad i got to meet john in person because i learned about who he is not just the bits and pieces that a facebook news feed gives me. he wished me luck on this project and i wished him luck as he tries to figure out what he will do as a next project–because he’s such a committed creative thinker there’s always got to be a next one! after lunch, i discovered i had a parking ticket. i thought i’d leave it. forget the laws of royal oak. but john was such a gentleman, he paid the ticket. probably so nobody in royal oak will think he’s friends with a scofflaw! then i drove, eight hours because i hit chicago rush hour traffic, so i could see f2fb friend #231 before the sundown of yom kippur! i had to give up on seeing elmore leonard in detroit. i became elmore leonard’s friend when elmore leonard still had a friends page. we had a mutual friend, mystery writer and f2fb friend #7 libby hellman. then he got a lot more friends. and presto! since january 1, facebook turned some friends, me included, into fans. there’s 17,119 of us. i think that means elmore leonard is not going to be a f2fb friend! This entry was posted on Saturday, October 8th, 2011 at 5:19 pm	and tagged with elmore leonard, facebook, father coughlin, friends, hour magazine, jack kevorkian, john s. schultz, royal oak and posted in Uncategorized. You can follow any responses to this entry through the RSS 2.0 feed.